What with the vampire and supernatural craze that has only seemed to become more and more frenzied since Twilight's release five years ago, and the many, many unauthorized sequels to famous works floating around out there, is it really any wonder that someone put two and two together and came up with Pride and Prejudice and Zombies? If you remember, Pride and Prejudice and Zombies is published by Quirk Books, a small publishing house, and everyone was a bit surprised at the enthusiasm shown for this book...it was even revealed that an unnamed and much larger publishing house tried to buy the book from Quirk for a very tidy sum. So, Pride and Prejudice and Zombies. It was crazy, funny, off-the-wall. I liked it. 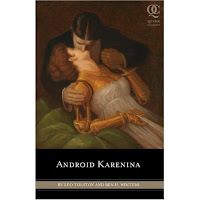 And it has opened the floodgates for even MORE paranormals spoofs...like Sense and Sensibility and Sea Monsters, Little Women and Werewolves, Android Karenina, Emma and the Vampires, Mr. Darcy, Vampyre, Jane Slayre (ha, get it? ), Abraham Lincoln: Vampire Hunter...plus, there is a sequel to the one that started it all, Dawn of the Dreadfuls, AND I've heard rumors of Queen Victoria: Demon Hunter. So, pretty much every paranormal thing you can think of has been covered and stuffed into a classic. But, not to be outdone, HarperTeen is launching a few new books written especially for teen readers, and the first, which will hit stores on May 4th, is Little Vampire Women. Pretty self-explanatory, right? The next is Romeo and Juliet and Vampires. So, I guess what I want to know now is...do you all think this is as funny as I think it is? I will admit, I've only read two of the aforementioned books (Pride and Prejudice and Zombies, and Mr. Darcy, Vampyre Slayer) and I own one other (Little Vampire Women), so I can't exactly vouch for them and recommend if they are all worth your time. Personally, I thought P&P&Z was really funny (my male classmates said about this one, after seeing the pictures, "Whoa, I might actually want to read this! "), and the Mr. Darcy spoof mediocre. It's quite a funny trend, but it seems as if you can't really get in on the joke without having read the true classic. Plus, I can't help but wonder how Shakespeare, Austen, Bronte, Tolstoy, Alcott, Lincoln, and Queen Victoria would feel about these quirky (and more than a bit irreverent) works. I think they are hilarious, even if I don't feel the urge to read every single one, but many people I have spoken with express strong displeasure at seeing these classics violated with things that go bump in the night. I want to hear your thoughts, so here is your chance to weigh in: Are these paranormal parodies funny, ridiculous, or maddening? Why do you believe so? Do you think this trend will last? And if you have read any of them, what are your thoughts? It doesn't offend me from a literary standpoint, but more from a reader's. I think the schtick's up, and by continuing to play off the same themes over and over, it does harm the publishing industry. They are overlooking new, strong talent for more of the same. This trend, taken lightly, is funny. But this is going overboard, I think. So not a fan. The first one made me giggle, because it was an original merging of classics and a popular genre. But I agree with Kelly--time for this trend to go bye-bye. I think they are funny but not sure if I'll be ready any for awhile. I'm sort of put off by paranormal everything right now. The covers are sure funny though. From the first time I heard of P&P&Z, I groaned and have stayed as far away from them as possible. However, I picked up P&P&Z at the bookstore the other day, read the first few chapters, and was actually moderately entertained. I think it's because Austen is such great fodder for satire and spoofs, because her writing is itself a satire on the marriage conventions and social constraints of her time. I'm not very happy that they're "updating" these classics with spoofy paranormal elements. In my honest opinion, we could do without them. However, I also know of a ton of people who had never even heard of the classics until through these Quirk Classics. As the great librarian-educator creed goes, if it gets them reading, then who are we to tell them no? Having not read the spoof of Romeo and Juliet, I can't say anything of the quality, but personally I think Shakespeare would be flattered. He was a sarcastic man in the first place, judging from his works, and I think he would appreciate that someone would be willing to take his classic tale of love and spoof it with some pop culture. However, I am a bit concerned that it may be too similar to Twilight, as it was based off the play in the first place. I suppose we'll see. Well, I thought Pride and Prejudice And Zombies was funny at first, when it was the only one and new and original. Now, I find the rest of the trend sort of annoying, like they're just trying to capitalize off of the success of PPZ. Either way, I chose to spend my money on other books, but I won't begrudge those who enjoy the Quirk Classics. Honestly, I just think it's kind of ridiculous. PP&Z was a cool idea. Maybe one or two others was two. One for teens would have been okay. But it's gotten out of control. I wonder how many people will actually read all of these. I haven't read any of them and I probably never will. They don't offend me, but I don't see the humor in them and don't understand why there are so many of them. I randomly got one of the HarperTeen ones for review, not sure how I'll review it since I'm kind of biased against it from the start. I just don't find the concept remotely funny. I thought the PP&Z idea was funny to start, but now everyone is doing it! It'd be one thing if that was Quirk books thing-they had a line of mashups or something-but it's becoming every publisher now. It's getting overdone and really, I think it's a little annoying. Paranormal is still going strong, but can't we get some new genres in here?? I thought at first it was amusing and cute, but now that everyone is getting in on it, it just isn't as fun. Like vampires or zombies- once everyone started doing it, it just wasn't nearly as cool. I think the important thing in all of these adaptations is that they maintain a sense of humor. As long as they don't take themselves too seriously, they're seriously fun. I've read Quirk's first two mash-ups and enjoyed them as novel-length running jokes. I think the market will hit saturation pretty quickly though, at this point. There's also Adventures of Huckleberry Finn and Zombie Jim - had you heard of that one yet?